Photograph of a man identified by a family researcher as Captain James A. Creighton of Thomaston, Maine, and three of his grandchildren, all cousins. James A. Creighton was born 6 June 1821 in Maine, son of John and Joanna (Jordan) Creighton, born in Warren, Maine, and Thomaston, Maine, respectively. On 8 January 1849, James A. Creighton married Emily Jackson Meservey, daughter of Nathaniel and Susan (Ulmer) Meservey. 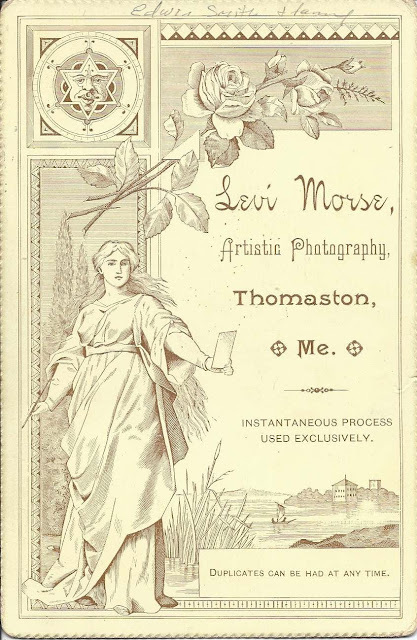 The couple raised eight children at Thomaston, Maine, three of whom died young, while James worked as a sea captain and later as a ship builder and lime kiln owner at Thomaston, Maine. Rita Creighton Smith, shown in the back row, was the daughter of James' first child, Emily Creighton and her husband Clarence Sydney Smith. Rita was born 6 October 1877 at Thomaston, Maine. Emilie Creighton, shown at left, was born 9 April 1883 at Thomaston, Maine, daughter of James' son John M. Creighton and his first wife Hattie M. (Robinson) Creighton. Emilie married Albert Trowbridge Gould. 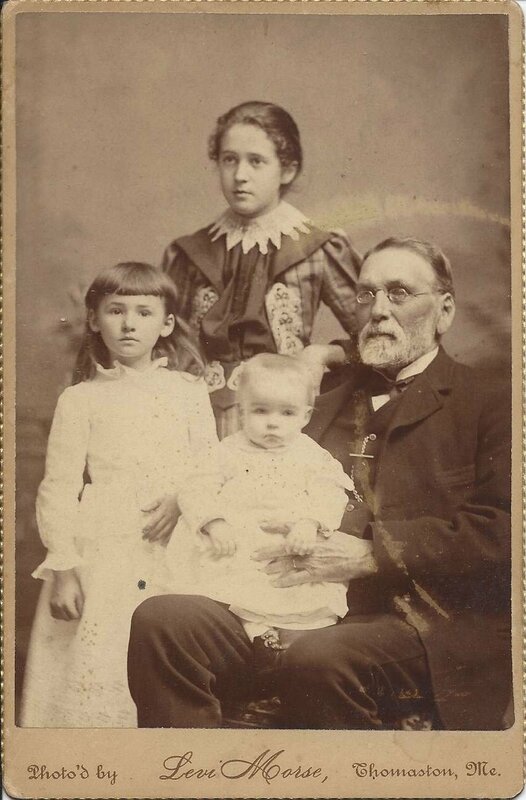 The youngest child in the photograph was Charles William Creighton, son of James' son Charles A. Creighton and Lois McLellan (Hyler) Creighton. Charles William Creighton was born 14 September 1888. He married Ruth F. Linnell. The Edwin Smith family to whom the photograph was intended was likely that of Edwin J. Smith, born 30 March 1826 at Thomaston, Maine, son of Edwin and Caroline Evangeline (Head) Smith. In 1852 he married Frances Maria Hodgman. They raised two children at Warren, Maine. Edwin died at Thomaston, Maine, on 1 July 1913 at Thomaston. Rita Creighton Smith's father, Clarence Sidney Smith, was a nephew of Edwin J. Smith. If you have any corrections or additions to the information above, please leave a comment or contact me directly.